We’re nearing the date when Anthem finally launches. Sort of. See, once again, EA’s got it in their heads that it’s okay to offer a bizarre and confusing launch timeline based on which edition you purchase and what platform you’re playing on. While standard preorders (and purchases, of course) get access to the game on its launch date, February 22, 2019, preordering the Legion of Dawn special edition will get you the same thing. Being a member of EA Access on the Xbox One or Origin Access Basic on the PC will get you an early access trial that allows you to play for 10 hours starting on February 15, but does not grant access to the full game when it releases. Finally, Origin Access Premier members get early access to the game on February 15 and will continue to maintain access to the full game when it launches for everyone on February 22. Oh, and all of those had access to the Anthem demo that happened during the weekend of February 1. If you’re reading this here on PlayStation LifeStyle, you probably plan to play the game on PS4, so I can make this simple for you. Anthem launches February 22, 2019. EA and Sony haven’t worked out any deals around early access. PlayStation owners don’t need to worry about convoluted timelines or subscriptions to various publisher’s services. Simply put, you’ll get to play the game on February 22 along with everyone else. If you’re reading this here on PlayStation LifeStyle and you don’t plan to play Anthem on PS4, I can still make it easy for you. Anthem launches on February 22, 2019. Regardless of the early access shenanigans, depending on Anthem’s confusing launch timeline will only last for a week. On February 22, those fragments converge and Anthem becomes like any other game. You buy it, you play it. 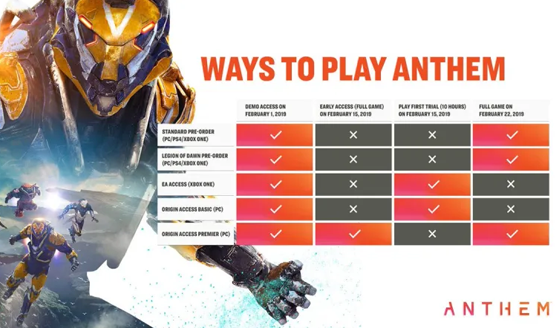 EA might have made Anthem’s launch so fragmented that they were forced to release a chart to clear up any confusion, and yes, that chart may have become something of a joke to most people, but as of February 22, none of that will matter anymore. Anthem is the type of game that BioWare and EA want you to be playing for a long time anyway, considering the free additional content and support they’ll be giving the game. I plan to play Anthem on PS4 anyway, which takes away the need to do calculus to figure out my launch date access. It’s easy to vilify EA (and any big publishers, really), but when looked at realistically, the company is just trying to provide value for its services in order to bring in more money. One might optimistically hope that more money means they wouldn’t have to shutter legendary studios like Visceral and shuffle their Star Wars games all around the galaxy. It’s already leading to free ongoing support for a multiplayer game. I’m not giving EA’s weird convoluted launch plans a pass here, but given the fact that we have to deal with them anyway, it’s only a week and then everything will be easier: Buy Anthem, play Anthem. You can purchase the Anthem standard edition and Legion of Dawn Edition on Amazon. This page contains affiliate links to products. We may receive a commission for purchases made through these links.